Banner reads: "NO to an Illegitimate National Conference; YES to a Sovereign Constituent Assembly!" It is under these conditions that, on Monday, March 11, a letter attributed to President Bouteflika was made public. It stated that he had never intended to run for a fifth term and that he had “heard the message” from the Algerian people. The letter announced a postponement of the presidential election and the convening of a “national conference” aimed at putting in place a new Constitution. In short, in the absence of a fifth term, what was announced was an extension by at least two years of the fourth term. It would take only a few hours for this announcement — hailed by some politicians as a “retreat” by the president and his entourage — to be rejected massively as a “trick” aimed at preserving the regime. The week of March 10 to 15 was the week of strikes. In large companies in the industrial regions — such as Sonatrach, Sonelgaz, El Hadjar, the National Society of Industrial Vehicles (SNVI), etc. — workers went into motion. Workers in the Akbou industrial zone marched on Bejaia, those of Rouiba marched on Algiers, each time with the local unions of the UGTA in the lead. In Skikda, oil and gas workers incorporated the students into their contingents. At the same time, teachers, lawyers and all different categories of employees took to the streets. All over the country, high school and university students continued to mobilise after forcing the ministry of education to annul the “forced holidays” it had announced as a way of defusing the massive student strike. Everywhere the students chanted, “We are not fooled!” It is in this context of workers’ and youth mobilisations, all firmly expressing the massive rejection of the presidential “proposals”, that the fourth day of demonstrations, scheduled for Friday, March 15, was prepared. Meanwhile, new rallies of trade unionists were convened on March 16 in front of all the local union headquarters of the UGTA, as well as at the UGTA’s central headquarters in Algiers [see correspondence below]. Friday, March 15, marked the fourth week of the demonstrations that began on February 22. The day after the announcements attributed to Bouteflika, one could ask oneself what would be its effect on the mobilisations; the answer was provided at noon by the Algerian people. In Algiers, two hours before the official starting-point of the demonstration, and despite the absence of buses, metros and trams, miles of long queues of men and women of all ages made their way to the assembly points. Across the country, huge crowds could be seen demonstrating peacefully, waving thousands of signs and banners expressing the deep rejection of the system and the aspiration of the Algerian people to speak out again in their own name. In many contingents, the signs were sharp and pointed: “Your tricks don’t work!” After having come up with a logo with the crossed out number 5 [for the fifth term], thousands of new and updated signs could be seen everywhere that crossed out number 4.5 — reflecting the widespread opposition to the extension of the president’s fourth term in office and, by this means, rejection of the regime itself: “No fifth term and no four and a half term either!” Everywhere, as in previous weeks, tens of thousands of Algerian flags expressed the aspiration for sovereignty and the refusal of any interference, particularly from the former colonial power, especially after [French President] Macron quietly made known his support for the initiative attributed to Bouteflika. In Tizi Ouzou, a large banner condemned the “system at the service of France and the USA”. On March 15, in the face of the massive show of force by the people, entire police battalions took up the demonstrators’ slogans, and scenes of fraternization were visible. The call issued at the demonstrations two weeks earlier: “Police officer, take off your cap and join us”, was repeated with greater energy. At the same time, when a representative of a party closely linked to the government, the Islamist Djaballah (Front for Justice and Development), was spotted in the crowd, he was greeted with the loud chants of “Get out! Get out!” by the demonstrators. The regime is fumbling as it tries to contain the situation. A regime spokesperson put forward the name of a “personality”, Lakhdar Brahimi — a former senior diplomat who held positions in the Arab League and the United Nations — to lead the hypothetical “national conference”. The press became full of revelations — and denials — about the opposition figures he reportedly brought into these discussions. At the same time, in all quarters, those on top are developing crisis “exit” plans based on a possible departure of Bouteflika at the end of April, to be replaced by a “transition” team. But here again, neither the Algerian people nor the working class have said their last word. On Sunday, March 17, the beginning of a new workweek in Algeria, the autonomous trade union coordinating committee of the National Education sector (UNPEF, CNAPESTE, SNTE, SNAPEST, CELA, SATEF) told both the new Prime Minister, and Brahimi that they reject any “dialogue”: “Our position is among the people.” At the same time, the presidents of the National Council of the Order of Physicians and the National Union of Public Health Practitioners called on doctors to mobilse in front of all hospitals. In the south of Algeria, on the same day, March 17, it was the turn of the workers of Sonatrach — the national oil and gas company — of Hassi R’Mel, to mobilise. Rising up from the desert by the thousands in their work uniforms, grouped around the flag of independence, they chanted a slogan demanding the departure of CEO Ould Kaddour. On the same day, March 17, the trade union councils and workers of SNVI Rouiba “withdrew their confidence in and support for the Secretary General of the UGTA” and “requested the holding of an extraordinary congress of the union federation”. 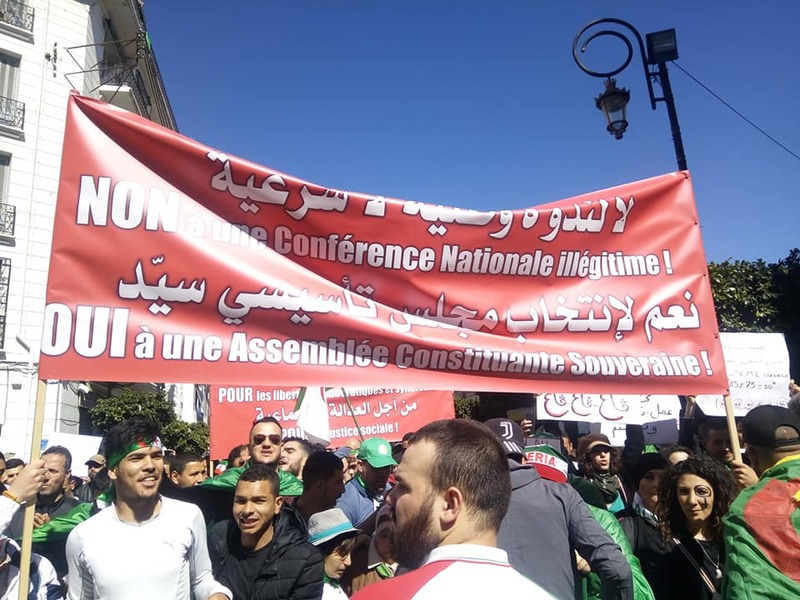 A correspondent of the Minbar El Oumel newsletter (Workers’ Tribune) participated on Saturday, March 16 in the rally of trade unionists convened at the headquarters of the General Union of Algerian Workers (UGTA) in Algiers. For the second time in two weeks, a national gathering of trade union leaders was held in front of the headquarters of the historic workers’ federation. The façade of the UGTA building had changed between the two rallies: no more giant portraits of Abdelaziz Bouteflika. They were removed because since the first rally there have been two massive marches across the country to reject the outgoing Algerian president and his regime. 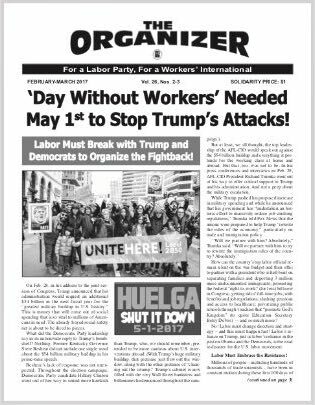 Above all, on March 10 the working class entered the struggle. For and through the strike, the workers have begun to reclaim their union. The starter shot was given by the local union UGTA of the very important industrial region of Rouiba. At the other end of the country, El Hadjar workers reinforced the process that began at the end of 2018 when they imposed new elections after occupying the headquarters of the local union. All the local unions of the wilayas [departments – editor’s note] of Tizi Ouzou and Béjaïa have accentuated the movement by demanding the departure of Sidi Saïd, the general secretary of the UGTA. The movement is now so deep that the national leaders of the federation were unable to organise a response to the rally on Saturday, March 16. The trade unionists, several hundred strong, came from twenty-five wilayas. All industrial zones were represented: El Hadjar, Rouiba, Constantine, Sétif, Bordj Bou Arreridj, Arzew, Hassi Messaoud, etc. Most of the trade union affiliates were represented. Also present were several co-founders of the trade union dating back to July 5, 1962. 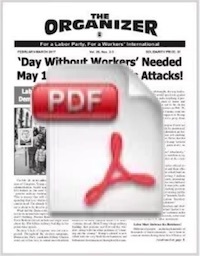 This link between the trade unionists who are fighting today and the “elders” was strongly expressed by one of the leaders of the protest, Mounir Betraoui, of the health federation, when in his intervention he called for the “return to the UGTA of Aïssat Idir”, the union’s historical general secretary, i.e. the UGTA “which was fighting at the same time for national independence and for the workers’ demands”. “Independent and democratic UGTA!” — this unanimous demand was echoed in all the other interventions, and echoed by the trade unionists gathered. The entry into struggle of the working class on March 10 and the process of recovery of the trade union federation, which is deepening every day, are what explain the publication, on March 11, of the “letter to the nation” by the outgoing Algerian president … a president who must now leave! — by Rachid Belfadel (published in Minbar El Oumel [Workers’ Tribune], Issue No. 3, March 17).